John Engstrom still speaks of walls. Three years after they caved in around him at Lakeland Mills, he isn’t talking of the wall he lifted off of co-worker Aaron Bonnett, freeing his leg and saving his life. Now, invisible, they close in around Engstrom, barriers that keep him from being healthy, and from living the life he wants to live. “From the time I leave my house I am pushing myself. It’s like I’m steadily pushing some kind of wall that’s holding me back all day long,” he says. “There’s a person inside me that’s just struggling, fighting to get the life I used to have back.” Some days are good. He might have two in a row where he makes it out of his house, walks at a nearby park. But often Engstrom’s energy will spike down, his motivation gone. Nearly $1.4 million was distributed to City of Powell River and community organization projects from Powell River Community Forest Ltd.’s best year of harvesting. At the Thursday, May 7, council meeting, Greg Hemphill, president of the community forest, arrived with the 2014 dividend cheque for $1,364,055. There was applause and exclamations of surprise when the over-sized cheque was revealed to the audience that filled council chambers and spilled out into the hallway. The provincial government will take a close look at the recommendations from the coroner’s inquest into the fatal Lakeland Mills explosion and fire, B.C. Premier Christy Clark said Friday. Twenty-two of the 33 recommendations were addressed to provincial ministries and agencies, many of them aimed at Jobs Minister Shirley Bond and WorkSafeBC. “We’re going to take every single one of them very seriously,” Clark said. …And so it goes, on to the coroner and the jury, who made more than 30 sincere and helpful recommendations that could go a long way to prevent something like this happening again. The testimony provided much-needed insight on mill operations leading up to that night but there it ends. For the Roche and Little families, as well as the living Lakeland victims, that is small consolation. They have heard the apologies made by Greg Stewart, president of Sinclar Group, the owner of Lakeland Mills. Now they are looking for someone to accept blame, to be accountable for what happened. Louisiana-Pacific Corporation (LP) reported results for the 1Q 2015. Sales for the 1Q of $472 million were higher by 6% compared to the year ago quarter. Adjusted EBITDA from continuing operations for the 1Q was $6 million compared to $23 million in the 1Q 2014. Loss from continuing operations was $35 million ($0.24 per diluted share), as the company said in the press release received by Lesprom Network. Construction on the new multimillion-dollar pulp and paper mill is slightly ahead of schedule, according to a report by C. J. Hopkins, secretary of Potlatch Forests, Inc. Completion date is tentatively set for Nov. 1. “We take pride in the way this work is progressing,” he said. Anchors for the new paper-making machine, which is scheduled for completion Oct. 15, have been set. Parts of the machine are now in transit to the mill. When Simpson Lumber announced in April that it would close its sawmill operations, laying off 275 employees at three Shelton locations over the next 60 days, the community, understandably, felt shocked. The sale of the company to California-based Sierra Pacific Industries represents a huge financial blow to many Mason County families. For others, the announcement also feels a bit familiar — from 1995-19, Simpson Investment Co. sold eight mills, company-wide. Interfor Corp. plans to curtail operations at its Tacoma, Washington, sawmill, effective at the end of the day May 22, as Random Lengths reports. A restart will be based on market conditions and the time frame for completing operational improvements. Interfor recently reduced hours at its mills in Port Angeles, Wash.; Molalla and Gilchrist, Ore.; and Adams Lake and Grand Forks, B.C., in response to market conditions and other factors. KapStone Paper and Packaging Corp. told its union this week that it will lay off 33 hourly employees in Longview as part of a companywide effort to cut costs. The job reductions will be spread out among the store room, yard, paper mill and old corrugated cardboard departments, said Greg Pallesen, vice president of the Association of Western Pulp and Paper Workers. The timing of the layoffs was not specified. The company also said there would be layoffs of salaried employees, according to the union, but no specific information was available. KapStone declined to comment. MISSOULA, Mont. — First Interstate Bank and its insurer are suing each other over who gets to pay a defunct Missoula logging company its $24.5 million verdict upheld by a state judge in April. The Missoulian reports Kelly Logging Inc. went out of business after its bank seized stimulus money from its checking account to repay a loan that was not in default. The company sued First Interstate Bank, and a jury awarded a verdict and punitive fees of nearly $17 million. What’s the most sustainable wood for my new deck? Q. Could you look into wood for building decks? A. You started with wood, so I will too (and so did 80 percent of U.S. deck builders, FYI). The natural stuff has much to recommend it, provided you opt for responsibly harvested lumber: Wood is nontoxic, renewable, recyclable, durable, and looks great. On the negative side, irresponsible harvesting can contribute to deforestation, loss of wildlife habitat, and climate change, not to mention major problems for the people who make their homes under high-value trees. That’s why it’s critical to look for wood certified by the Forest Stewardship Council (FSC), a third-party nonprofit that ensures that lumber is logged sustainably. So redwood or cedar from the Pacific Northwest or tropical hardwoods like ipe from Brazil – all excellent deck choices because they’re naturally rot-resistant – can be fine if they come with the FSC stamp of approval. The increasing use of timber construction in mid-rise building projects will be one of the key topics of discussion at the upcoming Frame Australia 2015 conference and exhibition in Melbourne. Being organised at Park Hyatt Melbourne on Monday 1 June, the Frame Australia 2015 conference will have the nation’s leading experts in timber and construction exchanging views on ‘Building with engineered wood construction systems’. Proposed changes to the NCC building height limits are expected to provide a major boost to timber construction in mid-rise building projects, given wood’s appeal as a sustainable and economic construction material. VANCOUVER – British Columbia’s premier is calling a wildfire that has already scorched more than 130 square kilometres in the central Interior “alarming,” and is warning residents of a “bad forest fire season” ahead. Christy Clark was in Prince George Friday to get an update on the Little Bobtail Lake fire, which was reported May 9. By the afternoon, the Wildfire Management Branch was reporting that nearly 200 people, eight helicopters, 22 pieces of equipment and eight tankers were battling the blaze that had forced municipalities to issues evacuation orders and alerts that residents may have to leave at any moment. “There has not been a fire this big, this early in the year since 1983, and this fire’s bigger,” said Clark. She called the fire “alarming” and said it was likely caused by humans. A large forest fire burning near Lodgepole in west-central Alberta since Tuesday is contained and under control. By Friday, it had burned 753 hectares. There have been 391 wildfires in Alberta this year, higher than average and almost double the number of wildfires by this time last year. By the end of the week, there were 140 firefighters, helicopters and heavy equipment battling the blaze eight kilometres northwest of Lodgepole. Geoffrey Driscoll, a wildfire information officer with the province, credited the quick containment of the blaze to the fast deployment of firefighters, the number of boots on the ground, and the accessibility of the area because of oil and gas roads nearby. 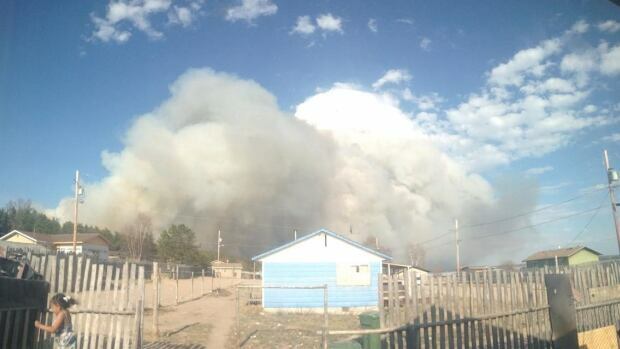 A forest fire has caused the evacuation of a community in Saskatchewan’s north this weekend. The large blaze is currently burning near the Black Lake Denesuline First Nation. Chief Rick Robillard said more than 600 of the 1,700 people who live on his reserve had to leave. Forty-seven adults and six babies were flown to safety in Saskatoon Friday night. Robillard said these individuals were taken to a hotel in the city as they face higher health risks from the heavy smoke than others do. A massive wildfire in northern B.C. shows that the province’s forests are increasingly primed for such blazes because of climate change and the El Nino weather pattern, an expert says. The 240-square-kilometre fire, first reported late Friday on May 8 near Little Bobtail Lake southwest of Prince George, is only 15-per-cent contained, according to a Monday update from the B.C. Wildfire Branch. Since Saturday, heavy winds almost doubled the size of the blaze and halted the progress of 270 firefighters, according to the branch. Lori Daniels, an associate professor in the University of B.C.’s forestry faculty, said Monday that the Little Bobtail Lake fire is symptomatic of more intense and longer fire seasons the province is now experiencing. Global warming has driven this change, Prof. Daniels said. Forest fires as news stories have always been popular. That has never changed. What has changed, however, is how the news media cover them. Not so long ago, the B.C. Forest Service welcomed reporters and photographers out to the front lines, to get up close to the fire and the forest firefighters working hard to put out the flames. These days, that’s considered unsafe, both for the journalists and for the firefighters. …. It’s important for everyone to see the great work being done by the brave, committed firefighters, as well as the devastation caused by fire in the forests. 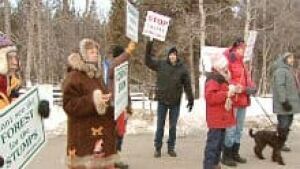 If Alberta’s new government sticks to its campaign platform, a controversial logging project could come to a halt The NDP’s environment platform in the recent election included a promise to protect the Castle Wilderness Area, in the southwest corner of Alberta, near Pincher Creek. That region has been the centre of a years-long dispute over whether it should be logged or not. “The Castle was the only conservation area that was specifically mentioned in the platform, so we’re really optimistic we can get something done,” says Katie Morrison, conservation director for the Southern Alberta office of Canadian Parks and Wilderness Society. A massive wildfire burning southwest of Prince George, which has forced 80 people from their homes, grew another 1,000 hectares Monday and now covers a radius of 250 square kilometres. The Little Bobtail Lake forest fire grew by 40 per cent over the weekend. The fire service had been hoping that wetter weather expected in the region between now and Thursday would give firefighters a bit of a break. But scattered showers on Monday also brought thunderstorms and gusting winds which instead helped the fire expand. SEATTLE — People throughout western Washington are all about spending time outdoors for recreation, but what about taking education outside? Forest schools are doing just that: breaking down the walls of the classroom and teaching kids outdoors. The concept is challenging traditional educations. Kids are taught self-esteem, teamwork and the value of nature while they play in the dirt. At Fiddleheads Forest School preschoolers are catching bugs, building fairy gardens and examining specimens under microscopes. Decked from head to toe in rain gear; the mud, the elements, even a Cooper’s hawk dropping a dead squirrel on a branch overhead, is not overwhelming for these young learners. In fact, it is what inspires their curiosity. Erie, Lafayette, Louisville, Longmont, Boulder and Broomfield are among a number of Front Range cities participating in National Emerald Ash Borer Awareness Week. As part of the week, which started Sunday and ends Saturday, trees in high-traffic public parks or along street rights-of-way are encircled with wide bands of green or yellow ribbon that warn of the invasive tree pest, according to a Monday news release from the Colorado State Forest Service. City parks and forestry departments, Colorado Tree Coalition volunteers and others have marked more than 450 ash trees statewide to offer a visual example of a mere fraction of the millions of trees in Colorado that could be lost to the invasive, tree-killing emerald ash borer, the release stated. Payson has a vital interest in protecting the C.C. Cragin Reservoir watershed, but then so does the whole of the Valley, Salt River Project administrator Bruce Hallin told a high-powered gathering of lawmakers and local officials on Wednesday. …Hallin spoke at the start of a three-day tour for about 50 movers and shakers, including a dozen lawmakers. Rim Country’s whole state delegation — Representatives Bob Thorpe and Brenda Barton plus Senator Sylvia Allen — attended the session that kicked off Wednesday night at the Mazatzal Hotel & Casino. On Thursday, they took a helicopter ride over the watershed and then toured struggling sawmills in the White Mountains. Though some doubted it could be done, the group of industry leaders, scientists, conservationists and government representatives has reached a consensus: the Tongass Advisory Committee has submitted its draft recommendations for managing timber harvests in the national forest that covers much of Southeast Alaska. “I could tell from the very first meeting that there were very smart, committed people at this table,” TAC member and Juneau Assembly Member Kate Troll said — but the devil’s in the details, she added. There were times when Troll thought the group had reached an impasse, but “we just kept talking through it,” she said. Thousands of trees in North Coast forests are dying, apparent victims of more than three years of drought and the bark-boring pests that flourish when water is scarce. The dead and dying trees, mostly pines, are adding flammable fuel to forests where the fire risk is already high because of California’s prolonged drought. The dead wood won’t cause more fires, but once ignited, flames will burn hotter and be much more difficult to control, posing potential danger for rural residents and firefighters, fire officials say. “It increases the intensity of the fire,” said Jim Wright, a Cal Fire division chief in Lake County, where most of the area’s dead trees have been found. Benjamin B. Wagner, the U.S. attorney for the Eastern District of California, criticized Kathleen Parker’s Dec. 21 op-ed column, “A wildfire of corruption,” in a May 2 Free for All letter [“Charges ‘devoid of . . . substance ’?”]. He proclaimed that the public was “well represented by the assistant U.S. attorneys in this office who worked to hold Sierra Pacific accountable for its acts.” Mr. Wagner has no basis for this statement. The only judge to assess the facts from this joint state and federal prosecution found there was insufficient evidence to proceed, that the state’s case was “corrupt and tainted ” and that the California Department of Forestry and Fire Protection (Cal Fire) must pay $32.4?million in sanctions for its conduct. Cal Fire’s partners in this effort were prosecutors from Mr. Wagner’s office. BLOOMINGTON, Md. (AP) — A wildfire in western Maryland has prompted officials to close a section of the Big Savage Trail in the Savage River State Forest. State Forest Service Fire Supervisor Monte Mitchell said Friday that crews have dug a containment line around a 100-acre section of remote, steep terrain that includes the fire. He says the fire has burned 30 to 40 acres since Tuesday. Mitchell says it will keep burning until there’s significant rainfall. In the north woods of Maine, Tom Shafer is bumping along on a rutted trail in his four-wheel drive truck. Ahead are mounds of maple, pine, oak and birch trees, all cut a century or more ago and pulled from the bottom of a lake. Clumped together in the muck, the logs wouldn’t look like much to most people. 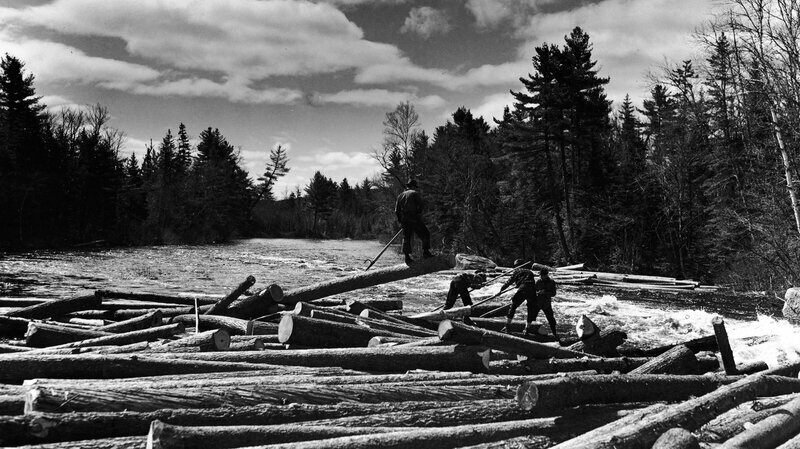 “The wood comes out and it looks like that, in those piles of mud,” Shafer says “It looks like construction debris.” Before the nation had highways, loggers had to move cut timber by floating it down rivers. But not all logs made it down stream to saw mills. WASHINGTON, — A local grassroots project launched last year marked an important milestone yesterday with the dedication of a new home for a family of four in Greenwood, South Carolina. The house was built by the Greenwood Area Habitat for Humanity on the site of an abandoned building. The project was supported by a Sustainable Forestry Initiative Inc. (SFI) Conservation and Community Partnerships grant, which provides funding to revitalize local communities using wood products certified to the SFI Standard to provide safe, affordable housing with sustainable forest resources. LYON COUNTY, Ky. – The trickle of Demumbers Creek has morphed into a swell of muddy water from farther upstream. The spaces between the dense trees are still alive with squirrels and birds where the current surrenders to the lake at Land Between the Lakes National Recreation Area. Amid the mild sounds in these backwaters, an unfamiliar clatter interrupts a placid retreat. The whine of heavy engines and huge logging trucks echo from deep inside the forest here. Occasionally the ground shakes from a fallen tree. While metro Vancouver ponders the impact of foreign ownership on real estate, some B.C. farmers are raising the alarm over what offshore buyers are doing with properties in the agricultural land reserve. The B.C. Agriculture Council has written to the government twice in the past month with concerns about foreign ownership of farm land. The concerns arose mostly from a British manufacturing company’s moves in the Nechako Valley, Prince George and Cariboo regions, where trees are being planted on previously cultivated land to collect carbon credits and offset the firm’s emissions elsewhere. Wood Pellet Power: A Climate Threat? Much ado has been made of late about the advantages and, increasingly, the potential disadvantages of using wood to create energy. Figuring out what’s what on that front has taken on new urgency, with renewable energy policies in Europe driving an unprecedented boom in the use of manufactured wood pellets to generate electricity. The vast majority of that wood fuel is being culled from American forests, making pellet-makers fat and happy — projections suggest it could become a multi-billion dollar industry over the next ten years — but causing forest advocates and climate campaigners to grow increasingly alarmed. The federal government spent $1.7 billion in 2013 fighting wildfires that devoured forests and rangeland. That year, wildfires burned some 4.3 million acres. If that sounds bad, the situation may only grow worse unless Congress invests more heavily in forest restoration. The U.S. Forest Service has said it has 82 million acres of land in need of restoration. Of that land, 65 million acres are at high risk of catastrophic wildfire. The Bureau of Land Management has about another 16 million acres it manages that needs restoration. One thing that could help is to create a better market for the woody biomass that is removed from forests during restoration work. BOGOR, Indonesia – Keeping carbon stored in trees. That’s one major way of tackling climate change. Natural regeneration, replanting, native tree plantations, commercial plantations and agro forestry systems have all be used as part of reforestation efforts. But a new study has found we can do better by ensuring that communities and ecosystems surrounding and within the forests are also more resilient to climate change. And it’s all in the planning. The renewable energy sector has welcomed a bipartisan deal over the Renewable Energy Target (RET), saying it clears the way for billions of dollars of investment in energy from sources like the wind and the Sun… While the Government dumped its last-minute attempt to have the target reviewed every two years to secure Labor’s support, it refused to budge on wanting to include the burning of wood waste as a renewable source of fuel. “Until we grow square trees we’re going to have off-cuts, both from forestry operations as we harvest those trees and replant them, and also from the saw-milling operations as we saw those fine tables and chairs and windows and the material that we all love and use in our houses every day,” he said.